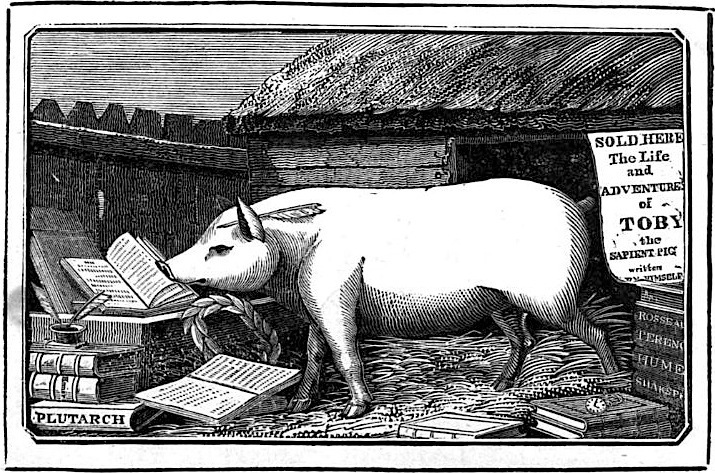 No Learned Pig -- and no Editor of such a Pig's memoirs -- could get far without having some books within reach. 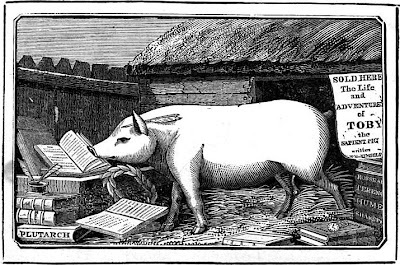 Toby himself mentions owning and a copy of Johnson's Rasselas, along with Samuel Croxall's edition of the Fables of Æsop, the ever-popular Ruddiman's Rudiments of the Latin Tongue, and Laurie and Whittle's New and Improved Atlas, Divided into Counties, the last of which he singles out as a worthy work of reference. He also tells us that he had a "standing order" from Creech's, the well-known Edinburgh bookseller, such that he could have a look at all their new titles, and purchase those that interested him. He mentions Swift, Smollett, and Pope as among his favourites, and he must have accumulated an impressive personal library; it is an immense shame that it no longer -- apparently -- survives. As Toby's editor, I too had at hand a library of vital books, although the most useful references were those available online, through whose contents I could instantly search for just the information needed. The most invaluable of these, by far, was British History Online; with its project of scanning all the various county histories, it's possible to take a certain town on Toby's route -- such as High Wycombe -- and instantly discover its features as of the mid-1780's, complete with a little woodcut of the Guildhall he singled out for mention. For biographical details of many of the people Toby encountered, the online Oxford Dictionary of National Biography was inavluable; a subscription is required, and I'm fortunate that my college library has one. And, although it is sometimes criticized for issues of accuracy, I found the English Wikipedia to be generally quite reliable. Yet no online resource can provide the real feeling and texture of history; for that, I was fortunate to have at hand such texts as Richard Altick's magisterial The Shows of London, David Coke's delightful book Vauxhall Gardens (where, though Toby did not himself appear, so much of the variety of life and amusements characteristic of his time could be found), and Roy Porter's English Society in the Eighteenth Century. And of course, along with Toby, I too sojourned with a variety of characters from the tales of his time, from Humphry Clinker to Tom Jones. For it is from and within books that Toby's world truly comes to life; for him, his manner of relating adventures were modeled upon the stories he had read and enjoyed, and penned -- I am sure -- out of a desire to see his life represented on equal and common terms with them.